Tocantins, the newest of Brazil’s 26 states, which was created in 1988 to seek its own paths to development in central Brazil, fell into the common plight of expanding borders, based on soy and hydroelectricity. The dirty water is killing more and more fish and ‘Taricaya’ yellow-spotted river turtles every day. In addition, the river is not following its usual cycle, and the water level rises or declines without warning, regardless of the season, complained three Munduruku indigenous law students in the south of Brazil’s Amazon rainforest. “Now we have internet and TV. Before, we didn't even have electricity, but it was better,” said Lourival de Barros, one of the people displaced by the hydropower plants which have mushroomed aorund Brazil, mainly since the 1970s. The construction of mega-hydropower plants in Brazil has been a tragedy for thousands of families that have been displaced, and a nightmare for the companies that have to relocate them as required by local law. In 1976, the construction of a hydroelectric dam destroyed farmland in the rural municipality of Chicoasén in southern Mexico. Forty years later, part of the local population is fighting a second dam, which would deprive them of more land. Paulo de Oliveira drives a taxi in the northern Brazilian city of Altamira, but only when he is out of work in what he considers his true profession: operator of heavy vehicles like trucks, mixers or tractor loaders. Laxman, a 10-year-old Koya tribal boy, looks admiringly at a fenced-in vegetable patch behind his home in southern India’s Andhra Pradesh state. Velvety-green and laden with vegetables, the half-acre patch is where Laxman’s family gets their daily quota of nutritious food. Agricultural losses are no longer the most visible effect of the drought plaguing Brazil’s most developed region. Now the energy crisis and the threat of water shortages in the city of São Paulo are painful reminders of just how dependent Brazilians are on regular rainfall. 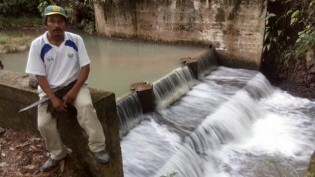 Since January, villagers and townspeople near the Los Pescados river in southeast Mexico have been blocking the construction of a dam, part of a multi-purpose project to supply potable water to Xalapa, the capital of the state of Veracruz. After its victory in a nearly decade-long struggle against HidroAysén, a project that would have built five large hydroelectric dams on wilderness rivers, Chile’s Patagonia region is gearing up for a new battle: blocking a quiet attempt to build a dam on the Cuervo River. The Itaparica hydroelectric power plant occupied land belonging to the Pankararu indigenous people, but while others were compensated, they were not. They have lost land and access to the São Francisco river, charge native leaders in Paulo Afonso, a city in northeastern Brazil.